Glucosamine is one of several supplements that help rebuild cartilage and restore synovial (joint) fluid. These types of supplements may be helpful in preventing disease as well as treating it. Note they treat the actual problem, and not just the symptoms. They include Glucosamine Sulfate, Glucosamine HCl, Chondroitin Sulfate, Green-Lipped Mussel (Perna Canaliculus, found in products such as Sea Mussel Plus by Food Science of Vermont, also sold as Green Mussel Plus by Mountain Naturals, available at Vitacost and Amazon), Sea Cucumber (such as NutriSea's Vetri-LOX, Sea Jerky and related products), other forms of cartilage (including from food sources, such as chicken necks and bovine trachea), hydrolyzed collagen protein, undenatured type II collagen (UC-II), and the injectables Adequan and Cartrophen (Adequan is used in the US, Cartrophen is used elsewhere). These supplements may also work better when they include a small amount of manganese. When giving glucosamine and chondroitin for arthritis, start out at high doses: at least 500 mg glucosamine plus 400 mg chondroitin daily for a small dog (up to 25 lbs), 1000/800 mg for a medium-sized dog (25 to 50 lbs), 1500/1200 mg for a large dog (50 to 100 lbs), and 2000/1600 mg for dogs over 100 lbs. If you see improvement, you can try backing off to a smaller dosage. Some dogs do well on less, some need the higher amount to get relief. If you don't see any improvement in four weeks, try a different brand. Different dogs seem to respond better to different brands. Glucosamine/chondroitin can be given with food. There are many arguments about which form of Glucosamine is best. I have yet to see anything I find convincing, as most of the arguments are made by commercial companies in support of their own products. However, if giving Glucosamine HCl, it should always be combined with Chondroitin Sulfate for better uptake, whereas Glucosamine Sulfate can be given alone. It is best if supplements also include Manganese, which can help increase absorption. Type II collagen (derived from cartilage) may work better than glucosamine and chondroitin, according to studies. See products at Amazon. It is unknown whether giving glucosamine helps to prevent arthritis, but there is no harm in doing so. If you are looking for plain glucosamine, for a dog not yet in need of anti-inflammatories, the Greyhound Gang rescue organization offers high quality supplements at very low prices, with proceeds going to benefit rescue (they also offer MSM, Vitamin C and other supplements). Some people report success with injectable glycosaminoglycans, such as Adequan (US) or Cartrophen (elsewhere) even when oral glucosamine and chondroitin have not worked (they can also be used together). Note that Adequan is giving intramuscularly (IM), while Cartrophen is given subcutaneously (sub-q). There appears to be no reason for this difference. I have heard of a number of people and vets giving Adequan sub-q with comparable results (sub-q injections are less painful for the dog and easier for the owner to give at home, if desired). See my post for more info on this topic. Warning: do not give Adequan to dogs with kidney disease. I've heard of two dogs with kidney disease who developed neurological problems after being given Adequan. Dogswell Happy Hips Chicken Breast with Glucosamine and Chondroitin contained almost none of the claimed glucosamine and chondroitin. Joint Complete for Dogs and Cats (Liquid Solutions) contained far less chondroitin than it claims. Joint Max Regular Strength capsules (Pet Health Solutions) contained far less chondroitin than it claims.This product also failed the same test in 2007. K-9 Liquid Health Glucosamine with Chondroitin and MSM contained almost no chondroitin. I've heard that this product passed all tests in 2012. BioGenesis Nutraceuticals ArthroGenX contained almost no chondroitin and was contaminated with lead. Joint Strength Essentials (MegaFood) contained no chondroitin and was contaminated with lead. Source Naturals Sodium Free Glucosamine Sulfate Powder was contaminated with lead. Estroven Joint and Bone (Amerifit Nutrition) was contaminated with lead. Nutrit-Vet Nutritionals Hip & Joint Soft Chews contained less than half the glucosamine and almost none of the chondroitin shown on the label in 2007. The same company's Hip & Joint Plus passed all tests in 2009. There is also a substance related to glucosamine called Hyaluronic Acid (also called Sodium Hyaluronate) that has been helpful for some dogs. Hyaluronic Acid has been used in intra-articular (into the joint) injection form for horses with great success. There is some question how effective it is when given orally. See the human product Synthovial 7 (and this study) and the product made for dogs by the same company called Hyaflex for more information (either product should be OK to use; the pet product has 2 mg HA per dropper, while the human product has 3 mg per dropper, so you would adjust the dosage accordingly). The Healthshelf site has directions on the amount to give and may have a better price as well. HylaSport Canine is a new product for dogs from a company who has made products for horses; I've heard one direct report of this product helping. Trixsyn is a similar product, which one person reported helping their dog considerably. The liquid glucosamine product K9Liquid Health Glucosamine & HA (best price found here) also contains hyaluronic acid. Cogent Solutions makes Baxyl Hyaluronan and Baxyl Pet RediDog. One person reported using the horse product Lubrisyn for their dogs with great success, including a Dane with Wobbler's and a GSD with severe HD, she gives 1 1/2 tsps daily to each dog. In the UK, look for Conquer K9 and Chondrogen EQ (also available in the US). Hyaluronic acid may be much more effective when injected directly into the joint (intra-articular), but this must be done under anesthesia. One version, Legend, can also be given IV (when given via IV, treatment may be repeated weekly for a total of three treatments). It is approved only for horses, but has been used to treat other animals, including dogs. A veterinarian who treats both horses and dogs might know what the dosage should be. The injectable form is sold for horses under the brand name Hylartin V (and maybe others). One person reported using the injectable form on their dog and said that the improvement from one injection lasted for about 3 months. See New Options for Old Problems - Relief from Arthritis for more information on these supplements. High doses of fish oil (body oil, such as Salmon Oil or EPA oil, not liver oil), as much as 1000 mg per 10 lbs of body weight. I have recommended high doses of Vitamin C in the past, but recent studies have found that vitamin C can actually make arthritis worse! See Excess Vitamin C May Worsen Osteoarthritis for more information. Bromelain (enzyme) given away from meals. Quercetin and other bioflavonoids (may work best when given with Bromelain). Boswellia (herbal). A 2004 study on dogs suffering joint pain found that boswellia offered significant clinical improvement. ActivPhy is a blend of neutraceuticals, including phycyocyanin, which is a blue-green algae extract that has been scientifically proven to reduce production of the cyclooxygenase-2 (COX-2) enzyme associated with arthritis in dogs according to this article written by a veterinarian: There is More Than One Way to Treat Your Pet's Pain. Alenza, made by Bayer, is a blend of nutraceuticals, including bioflavonoids, boswellia, and antioxidants (available from Amazon). Curcumin (herbal, also called Turmeric) -- I've seen the Turmeric Force product from New Chapter specifically recommended. Dosage recommendations vary; I've seen recommendations for 1/4 tsp turmeric powder for small dogs, 1/2 tsp for medium-sized dogs and 1 tsp for large dogs daily (I've also seen dosages twice that high). Curcumin extract is much more concentrated; equivalent dosage would be around 65 mg for small dogs up to 250 mg for large dogs (again, dosages can go twice this high). Start with lower amounts and give with food to avoid stomach upset. Note that curcumin might possibly be a concern when combined with NSAIDs, such as Rimadyl, as it is supposed to be a COX-2 inhibitor. Caution is advised, particularly if using high doses of curcumin or if any gastric (stomach) ulceration is suspected (curcumin may help with ulcerative colitis, but may make stomach ulcers worse). SAM-e (S-adenosylmethionine) is a nutraceutical used most often for liver support, but it can also help with arthritis. It is best given away from meals (preferably at least one hour before, or two to twelve hours after), and combined with a B-complex vitamin for greatest effectiveness -- more info here (human oriented) and here (dog-oriented). See dosage chart for recommended amounts to give. Never split pills -- if you have a small dog, you will need to use the smaller dosage pills, available at places such as PureFormulas (Vetri-SAMe, Sogeval and NOW brand offer 90-100 mg tablets), Medi-Vet, and HealthyPets. Also available at Amazon in both Home & Garden (marketed for dogs) and Health & Personal Care (marketed for people -- either is fine). See Joint supplements for dogs: The helpful vs. the hype for a veterinarian's take on several of these supplements. At this point, it appears that grains may increase inflammation and can make the dog much more painful, so a home made diet that does not include grains may also be helpful. The Chinese herbal formula Mobility 2 (Shu Jing Huo Xue Tang) is designed for arthritis with inflammation. See Getting Started With Chinese Herbs for more information on brands that can be trusted and dosages to use for dogs. Boron supplementation may be helpful both for preventing arthritis and for relieving symptoms, though it may only help when the arthritis was caused by a boron deficiency. Since boron is not a required nutrient in dog food, there's no way to know how common such a deficiency might be. The NRC has tentatively decided that dogs may need about 0.5 mg (500 mcg) boron per 1,000 calories (the amount they assume a 35-pound dog needs). Dosages of up to 20 mg (0.3 mg/kg or about 0.14 mg/lb of body weight) are considered safe for adult humans and should be safe for large dogs as well, adjusting the dose downward for smaller dogs. Note that some arthritis supplements contain boron, though sometimes the amount is so small that it would not be likely to provide any benefit. If anyone does try this, I'd be interested in hearing about the results (see my Contact page). System Saver contains boswellia, orange peel (source of bioflavonoids), curcuma longa (turmeric), and camelia sinesis, all natural anti-inflammatories. Two testimonials are from sources I trust: see Kiri at Wolf Park and Sandy Prantl Wolf Park Testimonial. Available from Amazon. AR-Encaps from Thorne Research. This product made for people contains glucosamine, MSM, boswellia, curcumin, and devil's claw. One person reported marked improvement in their 12-year-old Border Collie mix using this supplement. Kemin (formerly Genesis) Resources Pain Plus contains yucca, boswellia, MSM, meadowsweet, cornus, licorice, ginger, and manganese. One person reported this supplement helping her dog with fused vertebrae be more comfortable. Another reported that her holistic vet recommended this product over DGP (below). Available from Amazon. Oliver's Supplements contain boswellia and VitaCherry HiActives (flavonoids). "Mood Formula" also provides DLPA (see my Chronic Pain web page for more information on this ingredient). NutriSea Vetri-LOX from Coastside Bio Resources. A friend of mine used this supplement for her older Rottweiler who has had disk surgery on his neck twice, and had a lot of difficulty getting around. She used higher than (1 1/2 times) the recommended dose, but within three weeks this dog was playing like a puppy and able to go up and down stairs and get on and off the couch without help, which he had not been able to do for years before. She discontinued the NSAID he was on (Etogesic) as well as a muscle relaxant he was taking at night, and he's doing better then ever before. The orthopedic surgeon saw him after he was started on this supplement and was amazed at how well he was doing. She said others who know the dog have commented on how much happier he seems, in addition to being able to get around better. Available at VNF Nutrition, Botanical Dog, Critter Store, and elsewhere. Note this company also makes Sea Jerky and other mobility products for pets (and humans). Turmeric powder, also available in extract form called Curcumin. One person reported success with his two 80-lb Labrador Retrievers with hip dysplasia by giving them each 3/4 tsp turmeric powder twice a day (the dosage he found was 1/16 to 1/8 tsp of turmeric root powder per 14 lbs of body weight). He also continued to give a glucosamine supplement. Both dogs regained full mobility and were able to discontinue taking NSAIDs. Start with a lower dose and build up gradually, to avoid stomach upset. Note that this dosage is equivalent to 375 mg curcumin extract daily. Turmeric may work best when combined with bromelain. An article on Degenerative Myelopathy German Shepherd Dogs recommends giving 400-500 mg each turmeric extract and bromelain twice a day to a large dog (400-500 mg turmeric extract would be equivalent to 7.2 to 9 grams of turmeric powder, or about 1.5 to 2 teaspoons of powder). Cetyl myristoleate (CMO) is a medium-chain fatty acid that may inhibit inflammation. A couple of people have reported good results. More info at About.com. Animal Naturals K9 Joint Strong: "Without Joint Strong, my 8.5-year-old giant schnauzer (one cancer toe removed from front foot, both cruciate ligaments redone, and arthritis) can barely get up from lying down and walks very stiffly. With Joint Strong he pops right up, runs around and keeps up with the new, younger dog." Available at Amazon. K9 Liquid Health Glucosamine and Glucosamine & HA. Others have reported success with this company's Level 5000 product (8 oz size available at K9RawDiet). Best prices found here and also on eBay. Arthrisoothe Gold from NaturVet is a product that contains glucosamine, chondroitin and green lipped mussel, plus hyaluronic acid and a few other ingredients that can help with inflammation. I've heard directly from one person who has had very good results with her own dogs and rescues, and with working stock dogs owned by rancher friends. Also available as a liquid, and in powder or liquid form for horses, which is cheaper, though the formulations are a little different. Can buy at Cal Vet Supply and elsewhere. I have heard from two people whose dogs were helped by giving SynoviG3, when nothing else had worked (including one who tried giving SynoviMSM instead and saw her dog get worse). SynoviG3 is a glucosamine/green lipped mussel supplement that also contains creatine, which should never be used in dogs with any kind of kidney failure, and which can cause dehydration (which is very dangerous for the kidneys), so it is imperative that your dog always have access to fresh water if you are using a supplement like this. 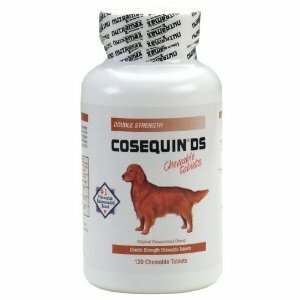 One veterinary recommended product is Dasuquin, which is a combination of Cosequin (glucosamine/chondroitin) and "avocado/soybean unsaponifiables (ASU)." A review of human studies found that avocado soybean unsaponifiables show beneficial effects in people with osteoarthritis. Homeopathics Zeel and Traumeel (find good prices at iHerb, Vitacost and Vitamin-Resource). DGP (Dog Gone Pain) is an herbal supplement from Australia that a couple of people have said helped their dogs (Amazon has the best prices I've found). You should not combine this product with aspirin or any other NSAID, as it is an herbal COX inhibitor and the combination may cause serious gastrointestinal problems. A couple of people have reported some success with Duralactin, a product derived from milk (Biovet has good prices; Puritan's Pride also carries this product, called Microlactin). Note that this product may cause gastric problems in dogs that have difficulty with milk products. See Going above and beyond NSAIDs to banish pain and inflammation for more information on these products. One person reported success using Natraflex Velvet Antler (they said that the Superflex sold for pets by the same company did not work for them). They also used Life Extension Velvet Deer Antler and Valley Springs Elk Farm velvet with success. See Clinical evaluation of a powder of quality elk velvet antler for the treatment of osteoarthrosis in dogs for more info. Note that the way this product is harvested can be painful to the animal and may be inhumane. Velvet antler might also be a source of chronic wasting disease (we don't know whether this affects dogs or not). MSM, Nettle Leaf Extract, and Blackstrap Molasses are sometimes recommended. Kaprex, which is marketed as an herbal replacement for NSAIDs (non-steroidal anti-inflammatory drugs, such as Rimadyl or Aspirin). I have heard only one direct report from someone who said it helped their dog, but have heard anecdotally that it has helped a few other dogs, and it would appear to be fairly safe, although since it acts in many of the same ways as the NSAIDs, it might also have some of the same dangers. Inflavonoid Intensive Care from Metagenics is a blend of herbs and anti-oxidants that can help with arthritis (click here for better price). Zyflamend is a relatively new herbal supplement being recommended as an alternative to NSAIDs. I received feedback from one person who said it really helped her extremely arthritic dog, as well as herself and various friends she has recommended it to. Another person reported improvement in her older dog when a combination of high doses of glucosamine, chondroitin, and MSM alone had not worked. Also available at Amazon. The herb Licorice is a natural anti-inflammatory that may be helpful for arthritis, and it protects the stomach as well. There is a possibility that Meadowsweet has some of the same components as aspirin and therefore might be usable as an anti-inflammatory even if your dog has problems with gastric ulceration, but studies are limited. Enzyme therapy, such as Wobenzym, which uses systemic enzymes (also called metabolic enzymes, or proteolytic enzymes). A generic version called NSI Flavenzyme is less expensive and should be fine to use, as NSI is a reliable brand. Serrapeptase is a proteolytic enzyme that may also help with inflammation, though there have been reports of this supplement causing joint pain, and it's recommended that it not be taken continuously, but pulsed, by taking it every other day, or five days a week. Note that enzymes should be given away from meals in order to be beneficial for inflammation. See Proteolytic Enzymes for more information. Pregnenolone, which is a hormone that may be helpful for arthritis due to anti-inflammatory effects. Not many studies have been done, and I could find nothing specifically related to dogs. It does appear to be pretty safe, although see this site for some info about possible side effects. I have heard from only one person who has used it, but she said it helped both her and her dog with arthritis. She gave 30 mg twice a day for two weeks, then 30 mg daily to a large dog. See the human-oriented article on Joint Support for additional information on several of the supplements mentioned here. Some dogs improve greatly simply by removing grains from the diet. There are a number of new grain-free foods available these days, which I note in the Commercial Foods section of my web site. Remember that it is very important to keep a dog with arthritis lean, as extra weight will contribute to the problem and its progression. See Pudgy Pups for a good article on helping your dog to lose weight. Also see the section on Senior and overweight dogs on my Commercial Dog Food web page. no dairy except raw. Yogurt is fine, cottage cheese is good. cartilage from the ends of large bones is beneficial. apple cider vinegar won't hurt, may help -- add 1/2 tsp. Use Ester-C (calcium ascorbate or sodium ascorbate) with bioflavonoids instead of ascorbic acid, which can be irritating. Note that I feed more meat, including red meat, and fewer veggies than is recommended above. I also use fish oil (body oil, such as salmon oil or EPA oil, not cod liver oil) instead of flaxseed oil, as it is better utilized by the dog, and does not contain the pro-inflammatory omega-6 fatty acids that flaxseed oil has. Piglet's diet is around 35-40% raw meaty bones (including canned fish with bones -- jack mackerel, pink salmon, sardines -- once a week), 5% liver and kidney, 25% fruit and veggies, and the rest is muscle meat, eggs, yogurt, etc. I do include garlic, ginger and celery in her veggie mixture, to help with arthritis. I try to feed as much variety as I can, including red meat. It is important that dogs with arthritis get adequate, but not excessive amounts of calcium, vitamin D and magnesium. If you are feeding a commercial diet, there should be no need to supplement with any of these. If you are feeding a home made diet, it might be helpful to supplement with small amounts of vitamin D (such as from cod liver oil) and magnesium. If your diet includes raw meaty bones, they should not account for more than around 50% of the diet. If your diet does not include bones, then you need to add calcium at the rate of around 1,000 mg per pound of food (1/2 teaspoon of ground eggshell yields about 1,000 mg of calcium).